Jamie and Kate were looking to extend their cosy but small Welsh cottage to coincide with a permanent move away from work in London and into peaceful retirement. “Back of beyond” is probably the best way to describe their secret location, but blessed with a sunny aspect and breathtaking views. Local architect Dean Benbow came up with a contemporary design featuring lots of natural light and creative use of space. Introduced to Rob at Castle Ring Oak Frame by a mutual friend while researching various build options, Jamie and Kate were soon persuaded that the drama and character of an oak frame would best suit their aspirations. During the design phase, Jamie and Kate toyed with the idea of exposing oak joists and rafters, but in the end decided that space was limited and that too much oak might feel oppressive. A 3D model showing both options helped them come to this decision. 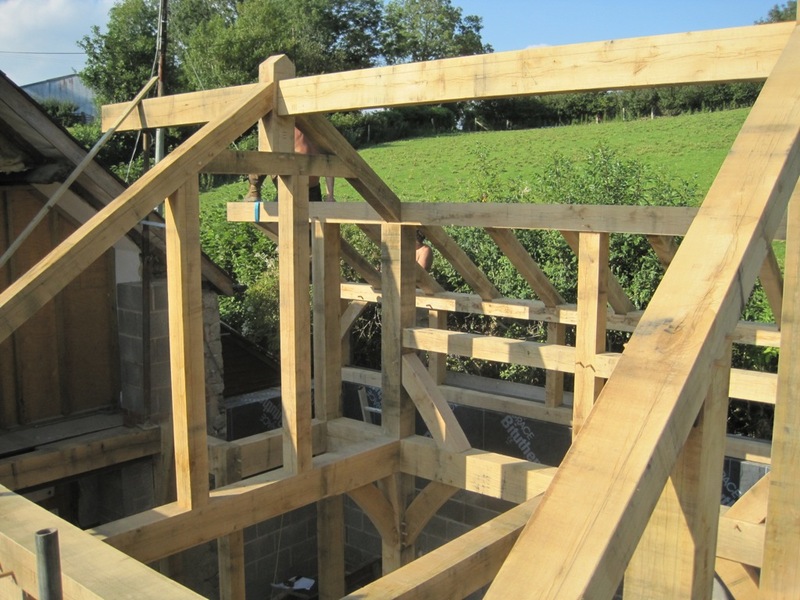 Despite being a small extension, there were tricky problems to overcome as the frame needed to tie into the existing cottage and sit on 3 different levels and slot in between existing walls on 3 sides! Usually a frame is quite flexible when being assembled and can be pulled apart to insert tenons into mortices. In this case however we would have been well and truly stymied if we hadn’t designed the floor beams to “drop in” from above with giant dovetail joints, lubricated with candle wax. Everyone’s relief was palpable as the frame quickly took shape and sat comfortably and accurately on the various levels, and in the late afternoon sun we were able to sit back and enjoy a cold beer with Jamie and Kate whilst contemplating a good day’s work.